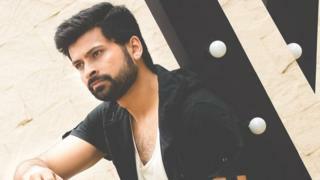 Image caption Santhu Swindon said his namesake town had "magic in the soil"
The star of a new Indian film partially filmed in Swindon has adopted the town for his stage name. Santhu Swindon is making his debut in the comedy Londonalli Lambodhara, due to be premiered in India on Friday. Partly filmed in the town, the actor said before filming began he decided to change his name to give it "meaning". He added: "Everyone makes fun of Swindon but a lot of Indians have flourished in the town and think it's got magic in the soil." Filming for the two-and-a-half hour film began in the Wiltshire town, with Santhu - previously known as Santhu Gopinath - cast in the lead role in his debut performance. "I came to the UK and it's nine years since I've been living in Swindon and I just love the place. It's given everything to me so I thought I'd give something back," he said. "Everyone makes fun of Swindon - that there's nothing much here but Swindon has got some magic in it, anyone who comes here flourishes." The subtitled Kannada language film tells the story of a small town boy from India - played by Santhu Swindon - who leaves his family and childhood love to move to London. Crews spent 16 days filming in Swindon and its "very pretty" outskirts as well as other locations across Wiltshire and the UK. It was premiered in Swindon at the weekend and was being released globally in India on Friday. But away from the silver screen, the actor said he was unlikely to change his name by deed poll. "I've got another job in IT," he said. "If I changed my real name to Swindon, I think they'd make fun of me."